— The first question is about the participants. Who is coming? Are they representatives of political forces or were the invitations sent based on some other principle? First of all, I’d like to say that the arrangements for the congress have been completed. Sochi is ready for this event. Yesterday we visited the conference’s venue. Everything is ready. Volunteers and staff who will be working at this event are geared up and ready to go. As you know, we finalized the lists of the forum’s participants a week ago at a meeting of representatives of the three guarantor states. In all, we sent more than 1,600 invitations to the participants of the Syrian National Dialogue Congress. The participants have already started arriving. They represent different groups within Syrian society. Right now, we cannot give the total number of participants but we expect between 1,500 and 1,600 delegates. All strata of Syrian society will be represented. These are the people, who care about Syria’s fate. The invitations were sent not only to groups taking into account their ethnic or religious identity but also to individuals, even to Kurdish representatives. The participations of the Kurds in the Congress is an interesting matter, which concerns many people. I can assure you that the Kurds will come but invitations were sent to them individually. — Another question. The High Negotiations Committee (HNC) made an official statement after the Vienna talks that they would not come. Nevertheless, if we look at the arriving guests, we see that there are people linked to this opposition group. Can you explain this? We sincerely regret that the leadership of the united Syrian opposition, which took part in the intra-Syrian talks in Vienna chaired by [UN Special Envoy for Syria] Staffan de Mistura, made this statement about its unwillingness to take part in the congress. We still hope that common sense will prevail and that the leadership of the united Syrian opposition will still decide to attend the congress. This possibility has not been ruled out, and the invitations remain on the table. 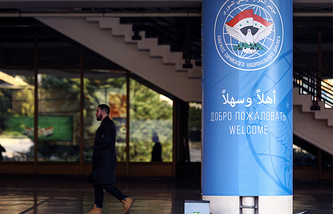 Some members of the united Syrian opposition opted to take part in the congress at their own initiative, including the Moscow, the Cairo groups and representatives of other groups, part of the united opposition elected in Riyadh. — As for the observers, Russia sent invitations to the permanent members of the United Nations Security Council and some regional countries involved in the Syrian congress. Could you tell us about these participants and the level of their representation? What will be Staffan de Mistura’s role? We paid special attention to this issue during the preparations for the Syrian National Dialogue Congress. We decided to invite observers. The Foreign Ministry sent invitations to the permanent members of the United Nations Security Council (the United States, the United Kingdom, France and China). Besides, it was deemed appropriate to invite Syria’s neighboring countries – Iraq, Jordan and Lebanon, as well as two Arab states – Egypt, which hosts the headquarters of the Arab League and has been actively participating in the process, and Saudi Arabia, which plays a leading role in the Organization of Islamic Cooperation. As for now, all the observers have confirmed their invitations. Furthermore, invitations were also sent to the United Nations, and Secretary-General Antonio Guterres. As you know, he decided to send his Special Envoy Staffan de Mistura, who has already arrived and today we will hold preliminary consultations with him. We are very glad that the UN has taken this decision, moreover that there are plans to hand over the results of the upcoming congress for the further use and progress towards the Syrian settlement, most notably at the Geneva talks. — What documents will be adopted following the congress and how will their implementation be ensured? One of the key issues will be the discussion of the current situation in Syria and the search for ways to resolve the conflict. Participants will definitely be provided with an opportunity to address the Congress and clarify their views on ways to attain peace in the country. One of the goals is to select candidates to participate in the activities of the commission discussing a new constitution. It is very important because this is the matter that we plan to hand over to Staffan de Mistura for implementation, in accordance with the United Nations Security Council Resolution 2254, so that he could continue his work. Moreover, the delegates will be offered a discussion on a final statement and to address the international community and humanitarian international organizations for help in restoring the country. — How do the current developments on the Turkish-Syrian border and the recent diplomatic activity by western countries complicate arranging the congress? — And what about the plan suggested by the “group of five”? 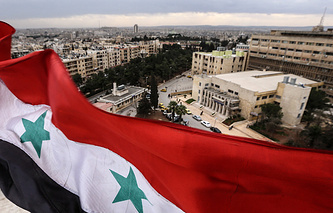 The experts consider it a first step towards dividing Syria. We support any initiatives aimed at fostering the political process and achieving peace and stability. Most importantly, these initiatives should be sincere and should not pursue their narrow, momentary goals. Therefore, we are calling for unity among the global community. This is the only way to resolve the existing problems. Moreover, the presence of Staffan de Mistura and other observers is a good signal. We still do not know what their representation will be, it will be decided in the near future. — How does the Sochi congress differ from the Astana and Geneva talks and how can this event be better streamlined than previous talks on the Syrian conflict settlement? These are totally different formats. The government and opposition are represented in Astana and Geneva but here, we have succeeded in convincing everyone that representatives of various strata of Syrian society should participate. It means those who are interested in achieving peace. There was a need to bring them all together so that they look each other in the eye and come to an understanding. — So, this will be the first time when different members of Syria’s society will be able to talk without mediators? That is totally right. This will be the first time that they will have a chance to talk with each other on the sidelines of the Sochi event.